Looking for an ecologically-responsible, fun-filled adventure? Panama City Beach has a surprising number of ways to experience nature above and below the water. With 27 miles of beach, two state parks and miles of on- and off-road bike trails in protected conservation areas, you can plan unique, wonder-filled moments like an encounter with a dolphin, a sunset kayaking trip, an airboat tour or a hike through a cypress swamp. When you go on vacation, you like to leave the smallest carbon footprint possible while still taking in the natural beauty of each unique environment. Panama City Beach offers you the opportunity to veer off the beaten path and take a tour of Shell Island, a seven mile stretch of undeveloped land. After a short boat ride, you’ll arrive at a secluded 700 acre barrier island where you will be surrounded by the coastal scrub forest and native animals like deer, nesting shore birds, and ghost crabs. Once you’ve explored dry land, delve into the emerald waters of the Gulf Coast with a kayak tour. Bay Point Water Sports can provide everything you need to discover the crystal clear waters around Shell Island. Rent a single or tandem kayak, with paddles and safety gear, for half or full day tours. 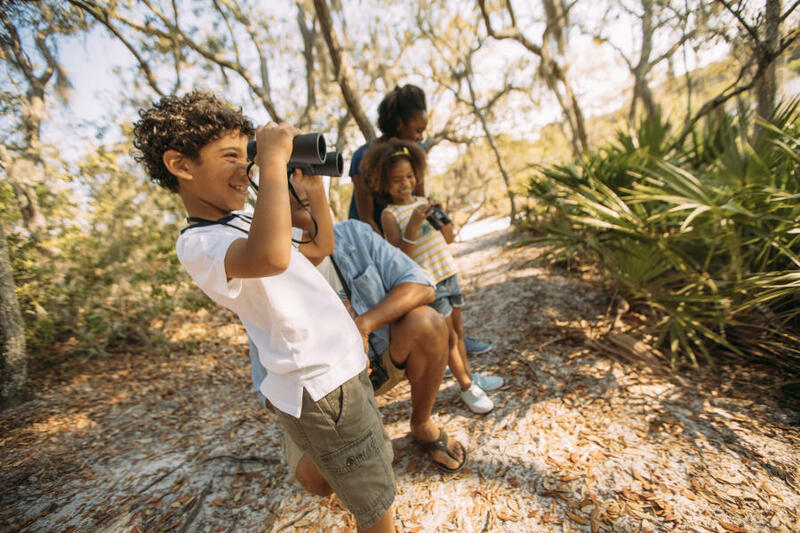 You love being surrounded by nature and experiencing wildlife in their natural ecosystems, and Panama City Beach provides the perfect opportunity to do just that. Airboat tours are some of the most eco-friendly ways to explore the waters around Panama City Beach because the blade is located above the waterline, so it doesn’t disturb wildlife or vegetation. Since the boats float on top of the water, if they do come into contact with an alligator or other animal, it will gently glide over them, leaving them unharmed. Airboats Gone Wild take tours through the marshes, while the comic captains at Airboat Adventures provide live gator demonstrations. Panama City Beach has some of the most beautiful state parks in the United States. Between the Gulf Coast and Lake Powell, Camp Helen State Park offers a variety of ecosystems, including salt marshes and freshwater wetlands. Take the day to hike, swim and just be at one with nature. On the eastern edge of Panama City Beach is St. Andrews State Park. To the south is the Gulf of Mexico. To the east is St. Andrew’s Pass, and the Grand Lagoon cradles the north side. This state park is alive with wild creatures including deer, migratory birds and alligators. Plus, the activities are endless. Hiking is the most popular pastime of park visitors, but you can also enjoy the water with kayaking or snorkeling. When the sun goes down, make the night sky your canopy by spending a night or two camping in the park. For you brave eco-warriors out there, St. Andrews offers everything from RV to tent camping. As an ecotourist, staying at one of the many houses along the beach is probably your first choice. You can step right out onto the warm sand first thing in the morning and even go for an evening swim, because the Gulf waters are your backyard. If you prefer to sleep under the stars, there are plenty of campsites for tent and RV camping. Bathrooms, laundry facilities, and wifi are available if you haven’t embraced the minimalist lifestyle completely. Most are close to the Gulf, and some are even right on the beach. Falling asleep to the sound of the waves on the shore sounds pretty wonderful, doesn’t it? You care about what you put in your body and how it affects the planet. Luckily, Panama City Beach has several restaurants that serve delicious organic, vegetarian and even vegan meals. Stop by Zen Garden Market, a community of local businesses focused on providing customers with organic, locally sourced food, coffee and sundries. Start your morning with coffee or tea from Wild. Root. If smoothies are your jam, step into Lotus Cafe and Juice Bar. The Morning Meditation, made with almond milk, cacao, banana and coffee, is a perfect way to start a fun-filled day at the beach. They serve lunch daily offering a wide variety of salads, sandwiches, wraps and tacos, with a full dinner menu Thursday through Sunday.